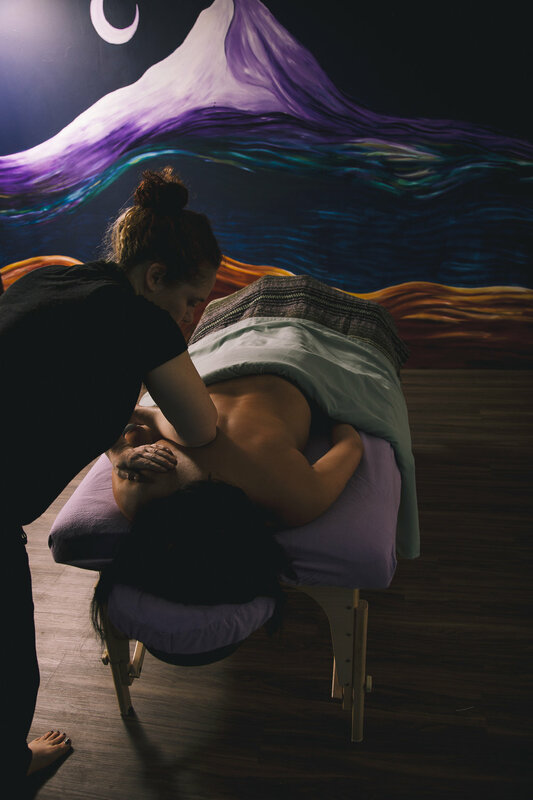 The benefits of massage and reiki are many, whether you are seeking relaxation, relief from pain, increased mobility, an overall balancing of your system, or even a fuller, richer life. And sometimes a body just needs a bit of compassionate touch to feel validated, present, and alive. Swedish and Deep Tissue for General Wellbeing: A blend of Swedish relaxation massage, reiki energy work, and deep tissue techniques for pain relief and light rebalancing in focus areas and the whole body. This popular treatment allows my patients to melt into the present while also taking home a bit of refreshing change. Contrary to the common concept that massages are a luxury, relaxation massage is an excellent form of self-care. Studies have shown that it reduces the harmful effects of stress and enables the body’s natural ability to heal itself. Deep Tissue Troubleshooting for Pain and Tension: This treatment focuses on one or two specific areas of discomfort, depending upon the length of the appointment. I often begin with Swedish techniques to relax and warm the tissues, assess the areas of tension and restriction, and help my client become accustomed to my touch. I then work deeper layers using reiki, muscle energy techniques, manual manipulation, and stretches. This type of focused work can often require some client participation, and can be excellent for overcoming pain and increasing mobility. In addition to the bodywork, I will send my patients home with stretches and strengthening exercises that will help them achieve long-term relief from pesky and painful problems. Commonly treated ailments that benefit from this kind of work include stiff/sore neck and shoulders, plantar fasciitis, back pain, and joint pain and restrictions. Structural Integration is a therapeutic bodywork technique that focuses on the fascia, or connective tissues, of the body in order to counteract postural dilemmas. Results can include pain relief, improved mobility, and rebalancing of the nervous system. In my practice of structural integration, I also include reiki energy healing to increase relaxation and promote physical and somatic release during the session. Reiki: An ancient energy-based healing system that involves a laying on of hands. Attuned in Level II Reiki, I am able to channel the Ki or 'life force energy' to places in a client's body where it is needed. Results can include relaxation, improved mood, better sleep, improved self-healing, reduced anxiety, and energetic boosts. Reiki treatments can also promote clarity of mind, notably around cultivating positive life changes and achieving dreams. Full Reiki treatments are done clothed, however a client may opt to receive reiki during a massage treatment as well. Because of the nature of the universal connectivity of the chi energy, reiki sessions can also be done over long distances and the treatment is still powerfully effective. A client receiving distance reiki may choose to relax during the time that the session is taking place, although it is not necessary. Sleeping through a reiki treatment is also an option, and not uncommon when I am treating clients who live on different continents in different time zones! If you are interested in setting up a distance reiki treatment, please email me at innerstellarbodyworks@gmail.com, or fill out the form below. Foot Reflexology: In addition to being a wonderfully relaxing and thorough foot massage treatment, foot reflexology helps to restore the balance and flow of energy by working points on the feet that correspond to different parts of the body. Although a highly beneficial method of self care and unwinding tissue restrictions, massage therapy is not a substitute for medical care. A massage therapist cannot diagnose or treat medical issues or apply prescription medications. Oregon law requires draping for all massage sessions. All massage therapy is strictly professional and non-sexual. Any illicit language, sexual references or advances will NOT be tolerated, and will result in the termination of the session with no refund and no future treatments. A 10% discount is available for patients paying out of pocket at time of service when paid in cash only. No invoice for insurance reimbursement will be issued when this discount is applied. 60 min … I do not charge patients when treating for motor vehicle accidents, but bill only the insurance company. To receive massage therapy for injuries related to a car accident, a claim number is required, in addition to a physician’s referral for massage. Structural Integration Series Packages available, inquire for details. All distance treatments include an email exchange to discuss your needs and aspirations, a reiki and sound healing treatment, and a follow-up email. Please fill out the form below to set up your distance reiki session. Please include a brief description of what you would like your reiki healing session to address.